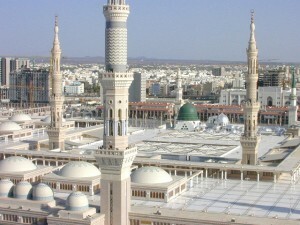 Masjid-e-Nabwi, was formed. In Islam, It is the second most sacred masjid and the second largest masjid in the world, after Masjid-ul-Haram in holy city Makkah. The location of suffah in Masjid-e-Nabwi is towards the front of the present Masjid-e-Nabwi, of the platform that housed the Ashab us-Suffah. This platform was originally on the north wall of the Masjid-eNabwi and when the masjid was extended in 7 AH it was moved back. In the initial years, Prophet Muhammad (PBUH) allocated a separate place with cool shelter right along with the wall located on North side of masjid. It was meant to build for spending and resting night especially for the passengers and for those people who could not go anywhere else, it shows the humbleness and kindness and actual teachings of Islam related to masjid. The name Suffah means “companion” or sahaba, those sacrificing and selfless Muslims who had devoted their lives for Islam. Hujrah (the sacred chamber) is situated just outside main masjid and has a golden vault in front of it. It was in actual the house of His most beloved wife Hazrat Ayesha (R.A) at that time. kaabahtours.co.uk is one of the authorized Hajj and Umrah travel agent based in UK offers a range of Ramadan Umrah Packages 2017 from UK.